Virginia history was made on a football field in Prince William County Friday. Both host team Potomac High School and the opposing team, Osbourn High School, have female kickers. Sixteen-year-old Ashley Vaisa didn't set out to play football when the season started a few weeks ago for Potomac High. She was an assistant trainer, working on the sidelines. But one day, she started goofing around after practice and easily punched the football through from 20 yards out. That was in her tennis shoes. The next day, she did it again in cleats. "When I started doing it with cleats, Coach King came up to me and asked if this would be something I would actually want to do," Vaisa said. Urged on by her close friend Hailee Strom, who was last year's kicker but then tore her ACL during spring soccer, Vaisa joined the team. Strom also started out as an assistant trainer last fall for the football team. She got nudged into kicking midway through the season by the head trainer. "The trainer saw me score from midfield at a soccer game my freshman year so he was like, 'You need to try out for the football team,'" Strom said. The kicking coach liked what he saw and Strom put on the jersey and pads. Head Coach Kevin King, whose own son and daughter are college athletes, said he didn't have to think twice about adding a female to the roster. "It's unusual but the thing is, if they are competitive and want to come out and give it a shot we're all for it," King said. The guys on the team are all for it too. Last year, their record improved dramatically after Strom started kicking. "We got better because she was an asset to the team," senior Steven Hill said. "She kicks balls from 30 yards out. Some boys can't even do that." But Strom tore her ACL playing soccer last spring so she's now on crutches after surgery. Senior Harris Heslip says they've accepted Vaisa the same way this year. "We need her," Heslip said. "In big games, she could be the one that turns it around." Vaisa admits she's had anxious moments as a kicker. "When they call 'field goal' I'm like, 'Oh that's me,' and I get a little freaked out," Vaisa said. "So I run out and do it as quickly as possible so I can make it and say, 'I did it!' and come back to sideline." Coach King said at the beginning, when she got upset, he pulled her aside to reassure her. "She was upset and I was like, 'Go home and cry all you can, but there's no crying. Go out and do the best your can,'" King said. "I feel very confident every time we put her on the field to make an extra point." Vaisa said it is a little different playing a sport with boys. "It's pretty fun at the games because you get more energy because the guys are all hyped up," Vaisa said. She also enjoys what she's been able to accomplish so far. "It makes you feel a little more confident [that] we can be on football field as well and make those field goals and extra points," said Vaisa. 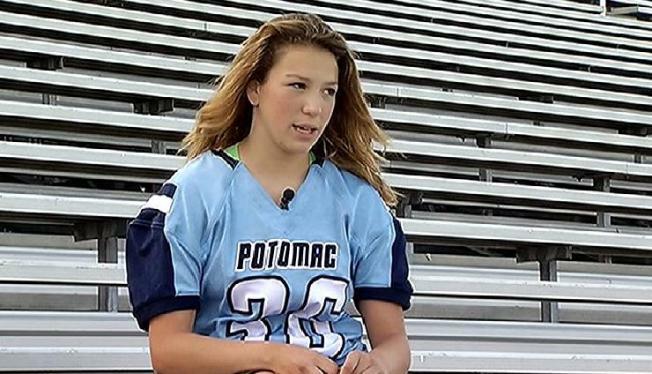 Vaisa and Strom are not the first young women to play football at Potomac -- it was back in 1997 that the Panthers welcomed their first female kicker. Friday, Vaisa helped Potomac defeat Osbourn 26-7 scoring an extra 2 of 3 points, without field foal attempts. Osbourn's kicker had a succesful extra point and missed one field goal.